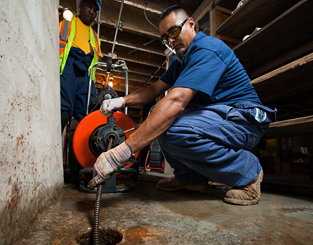 In many instances sewer line snaking is a great choice for stubborn blockages. This traditional method of drain clearing utilizes a steel cable “snake” and auger and was the first mechanical drain cleaning system. The snake auger is a corkscrew-shaped auger attached at the end of a bendable metal cable. Commercial snakes are typically run on electricity, but can be hand powered as well. The snake rotates in the clogged drain until it hits an obstruction, and then scrapes away the clog. If you have problems with tree roots clogging your main sewer line,we recommend you get your drain cleaned by our industrial strength drain snake every couple of years, and preferably annually. Apart from tree removal or sewer line replacement with PVC lines, roots will continue to grow into your drains year after year. Only annual drain snaking will keep your waste water flowing properly through your pipes. Call us directly at 519-676-0598 to make an appointment at your convenience.